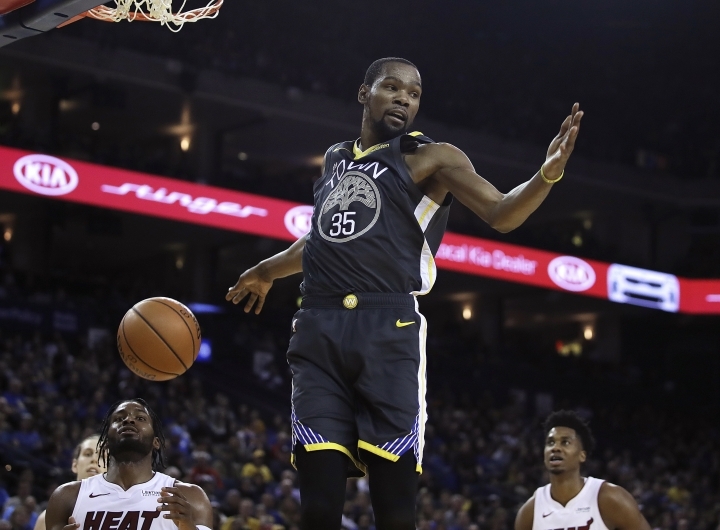 MIAMI — Golden State's Kevin Durant should have been called for a discontinued dribble on the Warriors' final possession of what became their 120-118 win over the Miami Heat, the NBA said Monday in a report detailing all calls made in the last 2 minutes of the game. The league, in its Last Two Minute Report that is released after close games, said it reviewed multiple video angles to determine that Durant's dribble was not interrupted by the ball making inadvertent contact with the foot or shin of Heat defender Justise Winslow and "a discontinued dribble should have been called on Durant." Also, the league opted not to fine Heat coach Erik Spoelstra for his postgame comments about the officiating — which were prefaced by Spoelstra beginning his remarks with "Look, NBA, do not fine me. I'm allowed to say this." Durant was being defended by Winslow with about 10 seconds left in a tie game, dribbling as Golden State's DeMarcus Cousins came to set a pick, the whole play unfolding not far from referee Kevin Cutler. Durant lost control of the ball and Heat assistant coach Chris Quinn — standing just a couple feet from referee Jason Goldenberg — was among those immediately lobbying for a violation to be called. "It's a double-dribble. Everybody can see it," Spoelstra said after the game. "Those are tough calls to make but everybody saw it. It's right there in front of everybody. That should be a violation and you can't miss those calls. But we had our chances. Like I said, it was back and forth. The officials — so let's be clear about it, so I do not get fined — that's not why we lost." "You hate to see 26-8 when our guys are going aggressively," he said.